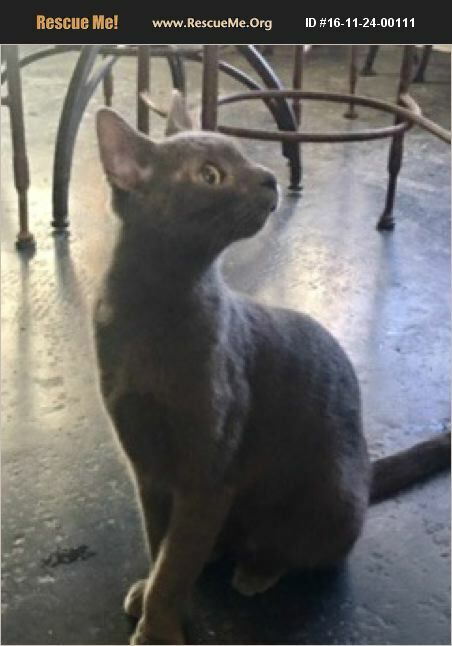 My name is Big Foot, and I am an affectionate, gorgeous Russian Blue/ silver DSH mix boy who was born in March 2015. I have the Russian Blue's signature sleek steely-gray coat, lithe body, beautiful green eyes, and cobra-shaped face with a perpetual smile. I am a complete Velcro cat and will cuddle with you the minute you sit down. My foster meowmy says that she'd be hard-pressed to find a sweeter, more loving kitty than I am. I love being with my humans, but I am also good with other cats as well as dogs. We Russian Blue mixes are known to be lovable, loyal, gentle, quiet, well-behaved, super intelligent, and clean. Now how can you beat that? My long legs and tail as well as my lean body give me an exquisite, stately, elegant aura. To find out more about Russian Blue mixes, please watch the 3-minute You Tube video that appeared on Animal Planet by googling 'Cats 101 Russian Blue.' Life has not always been as idyllic as it is now in my foster home. I had a bit of a rough start in life since my foster meowmy had to bail me out of the city kill shelter. Even after that, I struggled with a strange swelling of my foot that is responsible for my strange moniker, Big Foot. The vet thought that I was bitten by something but couldn't figure out what. I guess you're wondering why I am a special needs kitty? Well, it seems that being a typical Russian Blue mix, I get stressed out with any environmental change and a chronic upper respiratory infection rears its ugly head every time I try to find a new home. This manifests itself with nasal congestion and discharge that can only be helped by the vet's giving me nasal flushes. I need someone who will be patient with me, allow me to settle in at my new home, and if I get congested, take me to the vet for a nasal flush, which is not particularly expensive. It's not much to ask, but some people just are not interested in my being so much trouble getting settled in. However, if you want the sweetest cat ever, you should come to meet me! Foser meowmy says that I am definitely worth it! I'm sure that I will mesmerize you with my gorgeous emerald-green eyes as well as my gentle disposition and that you will take me home with you! Big Foot is updated on shots, neutered, dewormed, microchipped, FIV/ FeLV negative, and ready for his indoor-only home. No de-clawing permitted. His adoption fee is $100, cash or check payable to Buster's Friends. Please click the contact button if you are interested in Big Foot, and we can let you know exactly where you can meet him. To make the process more efficient, download the adoption application at http://www.bustersfriends.org/catadoptionapplication.shtml. First save and then open it; then you can print it and fill it out.